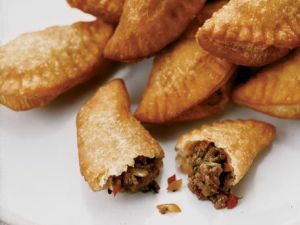 Beef Empanadas are a Venezuelan food recipe with beef stuffed pastries. Over medium-high heat, sauté the meat in a small, nonstick skillet, stirring often, until browned. Drain the grease from the pan. Add the onion, bell pepper, and garlic and cook for 5 minutes, stirring often. Remove from heat. 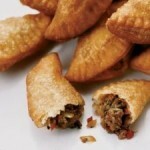 Stir in the raisins, spices, salt and pepper, green olives, tomato paste, and hot sauce. Place two clean cookie sheets in the oven for about 10 minutes. Spoon 1 tbsp. of the beef mixture onto the center of the wrapper.